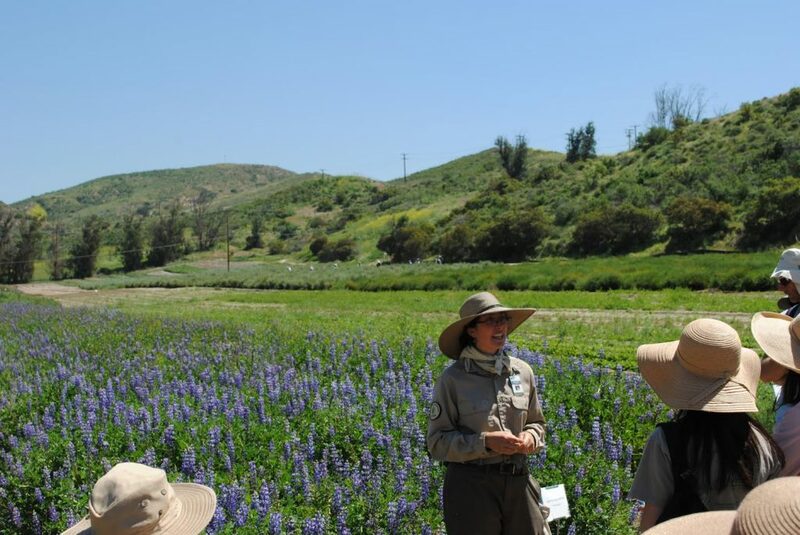 Irvine Ranch Conservancy invites the community to enjoy wildflower season on the Irvine Ranch Natural Landmarks by registering for a public program at the Native Seed Farm and across the open spaces. Nature lovers can also experience the sprouts and blooms of spring through a virtual wildflower tour on Tuesday, April 3 beginning at 6 a.m.
Due to recent rains, several types of local wildflowers are blooming at the Native Seed Farm on the Irvine Open Space Preserve. The Native Seed Farm produces thousands of seeds annually that help sustain the habitat on the Landmarks, and the field is blooming with wildflowers including purple owl’s clover (Castilleja exserta), California bush sunflower (Encelia Californica), and longleaf lupine (Lupinus longifolius). Beyond the Native Seed Farm, wildflowers including School Bells (Dichelostemma capitatum) and California poppies (Eschscholzia californica) are sprouting across the Landmarks in OC Parks’ Limestone Canyon Nature Preserve and throughout the Irvine Open Space Preserve. To celebrate wildflower season, Irvine Ranch Conservancy is launching its 3rd annual “3…2…1…Bloom: 24 Hours of Wildflowers” virtual tour. The virtual tour will feature 24 hours of wildflowers and showcase a photo of a different bloom posted every hour to the Landmarks’ Facebook, Instagram, and Twitter pages. Each post during the virtual tour will include a picture of a native wildflower, information on the species, and links to programs on the Landmarks where nature lovers can see these flowers firsthand. Join the virtual tour by “liking” the Landmarks’ Facebook page at Facebook.com/irlandmarks, following us on Twitter (@IRLandmarks) or Instagram (@OCMountainstoSea). Connect with the local lands and spot blooming wildflowers on the Irvine Ranch Natural Landmarks by registering for programs in the City of Irvine, City of Newport Beach, and OC Parks. All programs on the Landmarks are free with required pre-registration, which closes 4 p.m. the day prior to each activity. Minors must be accompanied by a parent or adult guardian. Click the activities below to register for a free program and experience the blooms of wildflower season. It’s Harvest Time! Collect Wildflower Seeds at the Native Seed Farm is a reoccurring program at the Native Seed Farm. Volunteers can give back to the land and harvest native spring flowers like California Poppies and Arroyo Lupines. Children as young as 8 years old can take this opportunity to help nurture and restore the wildlands within the Landmarks. The Self-Paced Fitness Hike on Hicks Haul Road is a reoccurring program where fitness enthusiasts can enjoy a walk, jog, or run to scenic Loma Ridge. Every Thursday from 6 – 7:30 p.m., participants and their families can spot California Poppies, Bush Mallows, and Paint Brushes while enjoying the beautiful vistas of Loma Ridge at dusk. Wilderness Access Day: Limestone Canyon on Saturday, April 7 from 8 a.m. to 2 p.m. invites hikers, bikers, and equestrians, to start their weekend off in OC Parks’ Limestone Canyon Nature Preserve. Visitors can explore over 15 miles of open space at their own pace and enjoy the sights and smells of wildflowers along the way. Mid Week Hike: Quail Hill on Wednesday, April 11 from 8 a.m. – 1 p.m. in the City of Irvine’s scenic Quail Hill allows hikers to enjoy the fresh air, sprawling views, and wildflowers while covering 12 miles of single-track trails. Visitors can use this time on the land to connect with nature in Irvine’s beautiful Southern Preserve. 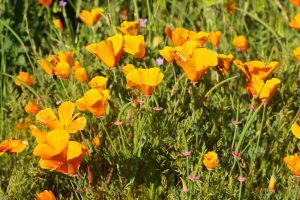 Mid-Week Hike: Agua Chinon and The Sinks on Wednesday, April 25 from 8 a.m. – 1 p.m. encourages hikers to recharge their batteries during a refreshing mid-week hike through the Agua Chinon Wash in OC Parks’ Limestone Canyon Nature Preserve where they can spot California Poppies, School Bells, and Lupine. Shhh…Hike, Look and Listen on April 26 from 5 – 7 p.m. in OC Parks’ Baker Canyon in Black Star Canyon Wilderness Park encourages visitors to take a slow and tranquil stroll through the open space while learning about the canyon and its plant life and wildlife. Irvine Ranch Conservancy offers free, docent-led, and self-guided programs that include hiking, mountain bike rides, horseback riding, habitat restoration and special events for nature enthusiasts of all ages and fitness skill levels. For more information on activities or to register visit LetsGoOutside.org/activities. Irvine Ranch Conservancy is a non-profit, non-advocacy organization created in 2005 to help preserve and support the Irvine Ranch Natural Landmarks, enhancing the public’s connection to the land while helping partners and landowners with all aspects of stewardship. The Conservancy offers a variety of free, guided outdoor programs for all nature enthusiasts including hiking, mountain biking, horse-back riding and much more. For more information, visit www.letsgooutside.org.